The tragedy project continues. 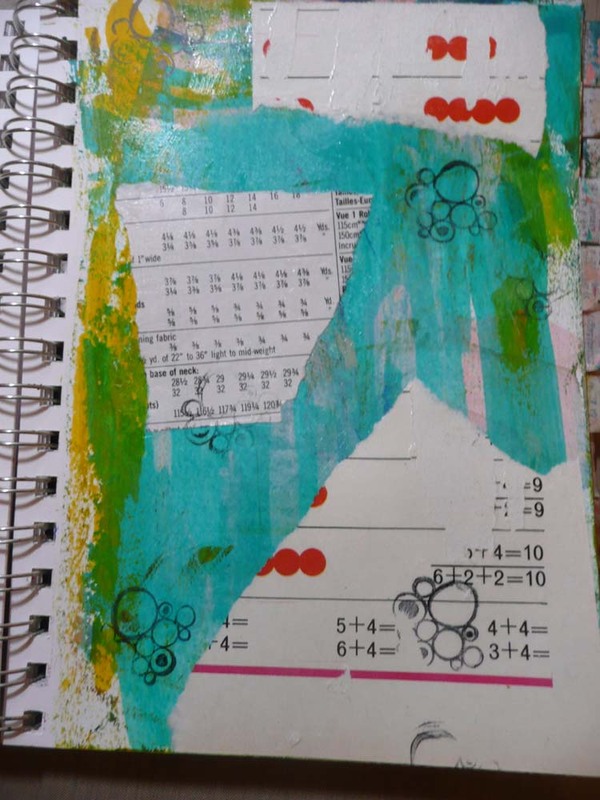 Today I completed step three of Journaling by 5s by Shannon Green. 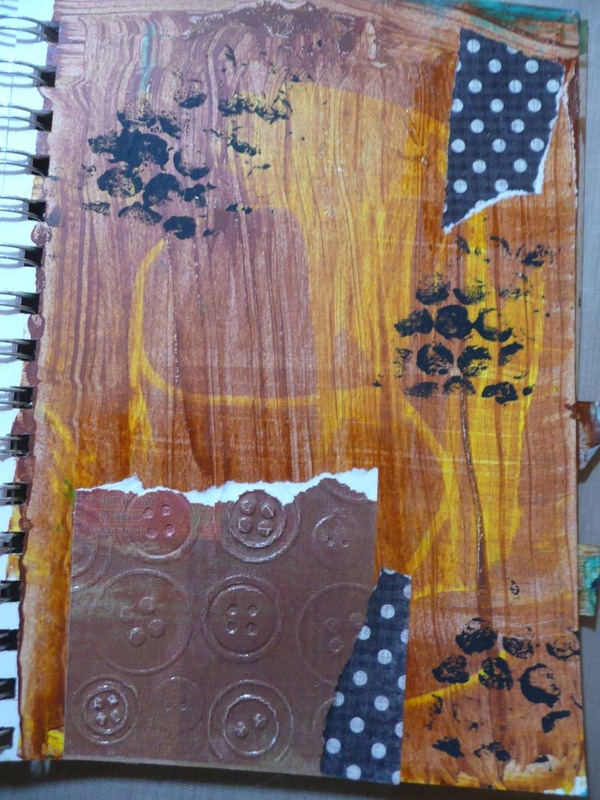 This session focused on adding pattern to the journal pages using stamps and/or stencils. Pffffft. How hard could that be? Well, actually it’s wasn’t that easy. 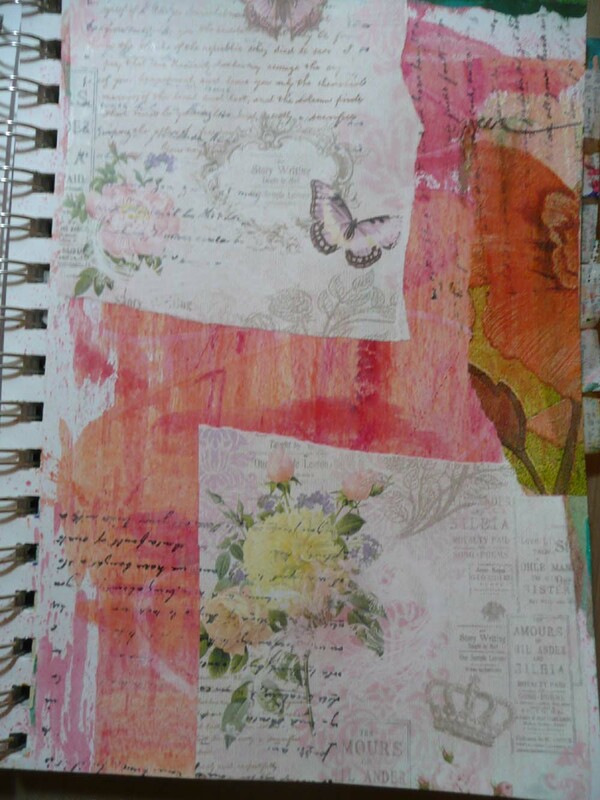 First I had to decide which stamps and stencils to use which in itself was a 15 minute exercise. Next was choosing the colors. For some reason I thought it was a good idea to pull out almost every ink pad I had thinking I’d do some colorful stamping. Yeah, right. 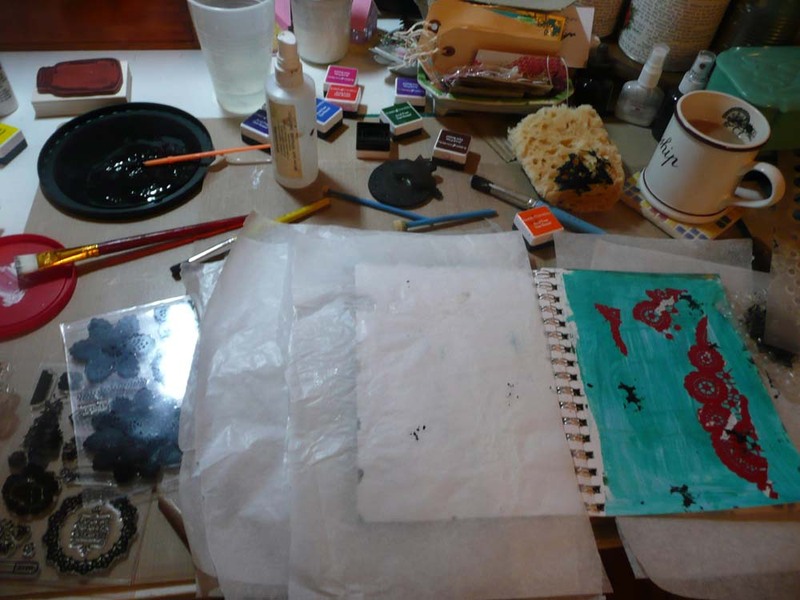 I did have a sane moment, though, and limited my paints for stenciling to black and pearlized white. It wasn’t long after I started the timer that I realized there was a lot of cross-contamination of colors going on and letting my Staz-On Ink pad sit open for 15 minutes was almost making me hyperventilate. I couldn’t use a stencil with an ink pad once it was covered with paint and I didn’t have time to clean off the stamps in between every color. So, as sadly this stage turned into black stencils and patterns made by a piece of bubble wrap which is usually one of my favorites. 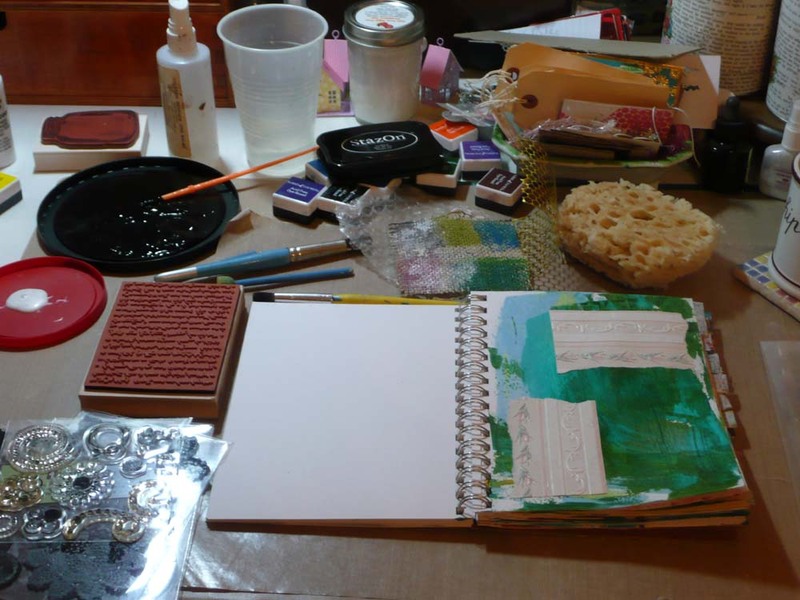 So much for colorful stamping and stenciling. Here is the result of today’s “play time”. Starting point when I still had high hopes for this session. I did like the use of the background script writing stamp and used it on several pages. Too bad it’s upside down! I tried to use an ink pad with a stencil which didn’t work so well. Yup! Black paint on bubble wrap. You’ve got to love it! 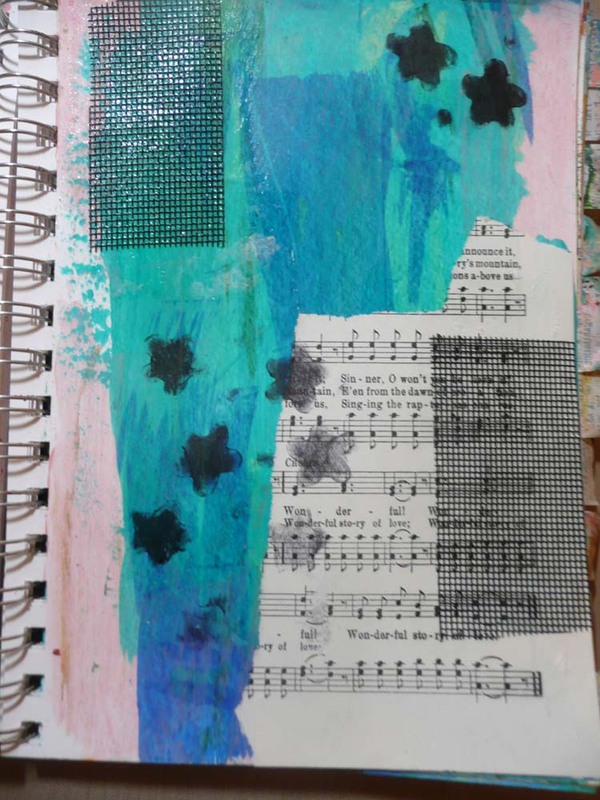 Even though Jounaling by 5s can be a little stressful, it is a lot of fun and I have been learning a lot, both about mixed media and about my own art style. Stayed tuned for tomorrow’s session when I add focal images and words! Time’s up and I’m left with a really big mess to clean up! Some day I’d like to try this. Looks like fun just slapping stuff down and not over thinking it.